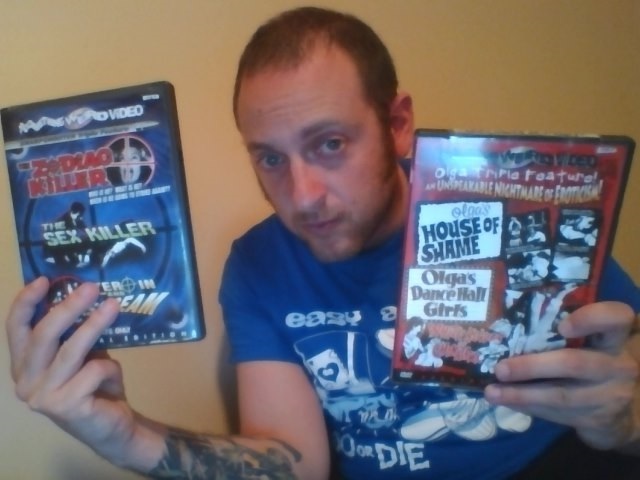 Before we get to the review, here’s a picture of me holding two DVDs I purchased at Thomas Video in Clawson, MI (metro Detroit). The store is sadly closing, signaling the end of the longest running video store ever. Yep, that’s me, Edwin Oslan, the Savage Hippie guy, who writes this crappy blog! Now for the review! I’m assuming that, when people see a movie called Cannibal Apocalypse, they think of Italian cannibal classics like Cannibal Holocaust or Cannibal Ferox (a.k.a. Make Them Die Slowly), but Cannibal Apocalypse (a.k.a. 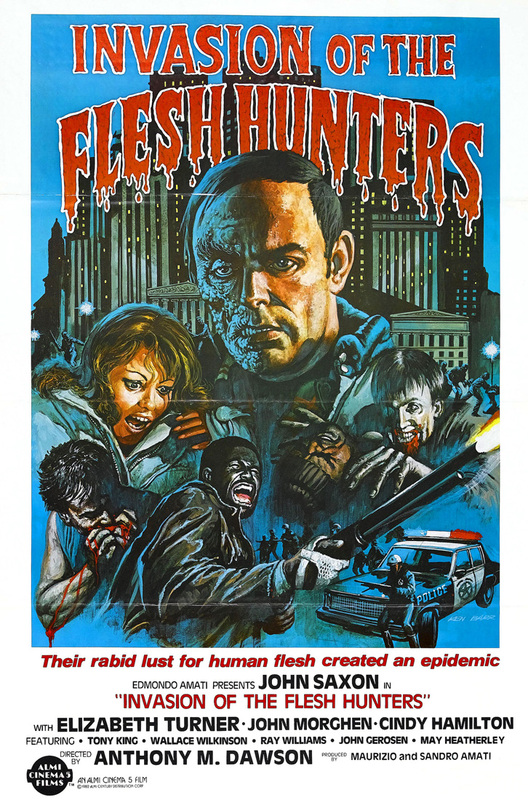 Invasion of the Flesh Hunters) is not a cannibal adventure flick, that’s set in some primitive jungle, where members of an exploring expedition get brutally tortured and killed after brutally torturing and killing members of a primitive cannibal tribe. On the contrary, the film takes place in a modern, urban environment, and the “cannibals” are actually infected humans. One of the cast members is Giovanni Lombardo Radice, the explorer in Cannibal Ferox who gets his wang chopped off, but that’s the only real connection. Well, that and the fact that the film was directed by an Italian and has a very stylish, European look to it, along with copious amounts of gore. So yeah, Cannibal Apocalypse was directed by Antonio Margheriti (who, for some reason went his whole career credited as Anthony M. Dawson) and stars John Saxon in what might be the actor’s strangest roll. The movie begins in the jungles of ‘Nam (actually a particularly tree covered Atlanta, Georgia hillside), where army dude Norman Hopper (Saxon) attempts to rescue two of his fellow officers from being held captive, only to have one of them, Charles Bukowski (yes, the character is named Charles Bukowski) (Radice), bite his hand. Right after, Hopper wakes up next to his lovely wife in a comfortable bed, and it’s revealed that the opening sequence was both a dream and a flashback. It’s also revealed early on that Hopper might have the disease as well, culminating in a particularly creepy scene involving Hopper and the cute, teenage girl living next door, in which Hopper feels the urge to bite the young gal, which she, in turn, enjoys because she’s a freak like that. Meanwhile, both Bukowski and the other captive officer, Tom Thompson (Tony King), are being held at a mental institution. For some reason, Bukowski is deemed sane and, within seconds of leaving the institution, goes on a mad biting spree, gets involved in a fight with some bikers, and ends up in a shootout with cops. He eventually frees his partner so they can both go on mad biting sprees and spread the disease. At some point, it’s hard to tell whose side the movie is on. Ultimately, biting people and spreading rabies is bad, but at the same time, since the hunters become the hunted, it seems as though the movie pulls a switcheroo on you, and now wants you to sympathize with those who you were once against! I don’t want to spoil the rest of the film for you; so just know that there are some neat chase sequences, lots of stalking, lots of biting, a couple of unexpected twists, and copious amounts of Fulci-level gore. I highly recommend Cannibal Apocalypse! If you got Cannibal Apocalypse on DVD, I also suggest watching the bonus interview with the director and cast members for some fascinating insight. Both director Margheriti and Radice laugh at the preposterous nature of the plot, while John Saxon read the thing as a metaphor for how the horrors of war never leave a person. Furthermore, during his interview, Saxon discusses how he was surprised at the level of gore and violence in the Italian horror films, which he’d never seen before; it’s actually quite amusing hearing his near child-like astonishment (“this stuff is so much more realistic and primitive compared to these new films, wow!”). I completely agree, John!